A quick look at what's been happening lately with everyone's favorite roller derby rule set. Even though the WFTDA did not issue a new rules update for the 2016 season, the association has still been working on making improvements to the rules of flat track roller derby that it publishes. Within the last few weeks, the WFTDA has announced two minor clarifications to the existing rules, and a set of two beta rules that may potentially find their way into the 2017 rule book. The latest beta testing program, which has just about wrapped up, is focusing on some “in-between” scenarios that are currently called as penalties. The new rules would turn these actions into non-calls under the specific situations noted in the beta testing documents. The first is a proposed change to Cutting the Track, which itself is an extension of a rule change implemented in the 2015 rules revision. Back then, the WFTDA made a tweak to the cutting rules (5.11) that allowed a skater that briefly and unintentionally (5.11.8) found themselves touching only in-bounds, after illegally advancing position out of bounds, to avoid a cutting penalty so long as the actions of the skater in question includes efforts to remain out of bounds (5.11.8.1). This was an improvement over how things were in 2014, where a skater already in the process of recycling and making an obvious attempt to legally get back into the play might still be hit with a cutting penalty just for pushing off on the wrong skate while rolling over the boundary. The WFTDA has indeed revisited this very section in the 2016 beta test, and it did so by doing one of our favorite things: simplifying. What was two rule points have become one for the participating teams to try out. 5.11.8 (Beta) – A Skater, having gone out of bounds, who returns to the track but then immediately exits, even if that Skater improved their relative position during their brief time in-bounds. This beta rule is effectively extending the grace period a player has to undo a track cut, allowing them to stay out of the box even if they happen to come back completely in-bounds with both skates after a cut. If a jammer is coming into a turn hot and makes an inside dive unsuccessfully, her natural reaction would be to immediately flip her skates around and hit the brakes to remain in the infield. If she had a lot of momentum, however, she might ride her toestops back across the apex of the turn, slide back across the inside boundary line, and return to the track after illegally advancing her position.1We remember seeing this exact scenario play out once or twice during the 2015 playoffs, though we didn’t think at the time to note these games for later YouTube linkage. Shucks! As it stands now, that warrants an instant cutting penalty. Under the beta proposal, that skater has a chance to immediately exit the track and recycle, no different than if she had stopped a few inches sooner to remain in the infield and recycle from there. There might be some subjectivity on what the limit is on a brief time in-bounds after a provisional cut. This may also inevitably cause additional official review delays during games to call or overturn cut calls, which are already the most-asked for and least successful type of official review. But if implemented, the beta 5.11.8 would only help reduce the number of penalties called in the WFTDA. Cutting penalties in general went down by about 1.5 per game during the Division 1 playoffs last year, perhaps helped by the first relaxation of the rule. A further loosening of it might take that down a few ticks more. We would love it if this change became another step towards a gameplay environment that eliminates the cutting penalty altogether, allowing (a.ka. 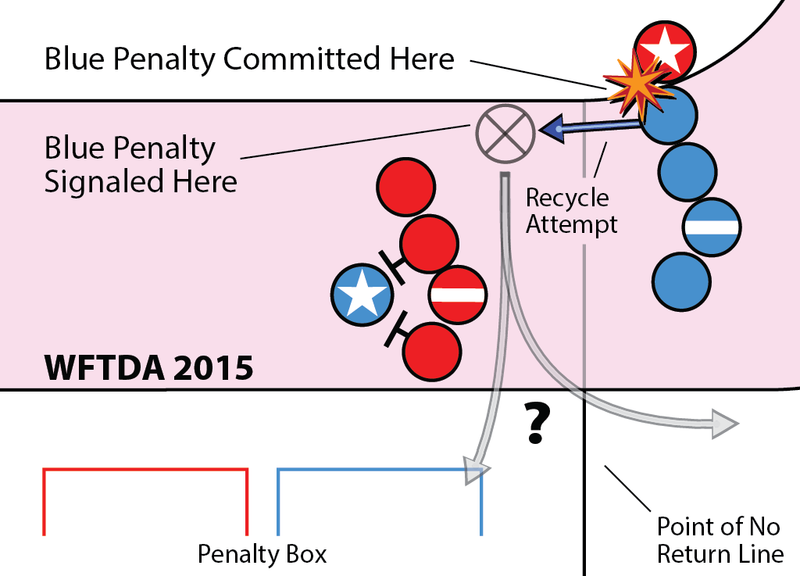 forcing, under direction of an official) any player that cuts the track to recycle—their only “penalty” being the amount of time they waste doing it.2This has been the standard in roller derby since its beginnings in the 1930s, and in the modern USARS and MADE rule sets. After all, why send a player to the box when the issue can be just as easily rectified on track? The other beta revision on tap may also reduce the number of penalties called during WFTDA gameplay. It seeks to undo the domino effect of one illegal action immediately causing the opposing team to commit another illegal action, which can often happen in a tight pack. This beta rule is all about who is the initiator of the illegal action. The current rule on the books, 4.1.2.1, states that all contact between opponents has an initiator. This has the important implication that any illegal and impactful contact between opponents must be penalized, with the initiator of said contact needing to go to the box. But what if the person doing the initiating was fouled upon by an opponent to cause that initiation in the first place? It’s easy to picture a scenario where a jammer recklessly barreling into a rear wall commits a back block penalty, which then causes the fouled skater in the wall to fall into the legs of an opposing blocker directly in front of her. Under the current rules, the victim of the back block is also the perpetrator of the ensuing low block, because all contact between opponents has an initiator and the initiator of a block is always responsible for the legality of their contact (4.1.2). That means the person who got fouled must also get sent to the penalty box herself, through no real fault of her own. This is obviously unfair. The rule proposal meant to address this and replace the current 4.1.2.1 makes sure that only the true initiator of the illegal contact gets sent to the box. 4.1.2.1 (Beta) – If a prior illegal block by an opponent causes a Skater to make unintentional and unavoidable contact to another or the same opponent, that Skater will not be considered the initiator and will not be penalized even if the accidental block is illegal. The pusher of the first domino would be the only initiator in this situation; any subsequent dominoes that fall as a result would not be at fault. In our above scenario, the jammer would still go to the box for the back block, but the beta rule would absolve the wall blocker from getting a penalty in the immediate aftermath of her fall, even if that fall causes the opponent in front of her to get tripped up.3Then again: If the third player that got low blocked then went on to inadvertently hook onto a different opponent and drag her down, is she responsible for that action and liable to get penalized, even if her getting tripped up was as a result of an illegal action, even if that illegal action cannot be penalized in this situation? This sounds good, but it still has the same potential pitfalls as the cutting beta rule. Are “unintentional” and “unavoidable” definable quantities, or are they judgement calls subject to referee inconsistency and more official review delays? Also, given the sheer number of contact fouls and further amount of unpenalized illegal contact that can happen during a game, we wonder how much “mental rewinding” referees will need to do to verify to themselves if a chain reaction of penalties were cause-and-effect events that only has one initiator, or independent enough to warrant multiple whistles. The WFTDA was correct in recognizing that the least messy way to address this problem in the rules was to situationally redefine (undefine, really) who the initiator of illegal contact is. Whether or not it would work in practice is another matter, but that’s why these sorts of things get beta tested. Switching gears from potential future rules to shoring up old ones, let’s quickly go over two rules clarifications issued by the WFTDA in the past week. A very minor technical clarification has to do with situations revolving around designated team captains and alternates calling for time outs or official reviews without the required “C” or “A” designation on their uniforms. The Q&A issued by the WFTDA clears up whether or not the action requested by the alternate should still be honored by the officials. The short answer is “yes,” because that player is still the alternate and has the powers of one even if they are not displaying it on their person. However, there is an illegal procedure penalty for improper uniforms (5.13.13), and in most cases that penalty will still apply if the alternate (or captain) gets caught without their “A” (or “C”) on display. It turns out that official review was rendered null and void when it was discovered that the London player asking for it was not displaying an “A” on their uniform—because they weren’t an alternate! You can see how this officiating error got explained away below. Had the London player requesting the review been an alternate in this situation, their review request would have been granted, but they would have also gotten an illegal procedure penalty for not displaying the “A.” The outcome of the review request would be determined after that. The last clarification issued by the WFTDA is one of those classic WFTDA situations where them making a change to one rule created an unintended an unforeseen problem in a different area of the rules. 6.1.1.1 – A penalty is considered to be assessed, and a Skater is considered to have been sent to the Penalty Box, once the action that warrants a penalty has been committed. This was meant to make it easier for jammer referees to track the scoring of points in situations when an opposing player got sent off the track for a penalty. It makes a skater a ghost point at the instant they commit a foul, even if they remain on the track for a few more moments while the refs communicate the penalty call to them. However, a problem has since arisen around what might happen in those few more moments in relation to a skater’s position with the point of no return line at the penalty box. If a skater is been considered to have already committed a penalty just past the line, but then recycles back in front of it before the penalty is communicated to them, don’t they still have to skate all the way around to enter the penalty box properly? After all, a Skater is considered to have been sent to the Penalty Box once the action that warrants a penalty has been committed. This has been a point of confusion between referees and penalty box officials. Not to mention skaters; this small but critical de-syncronization in the rules could add several seconds of penalty time to a player that doesn’t immediately realize she must loop all the way around the track. The rules clarification issued by the WFTDA to fix this is in fact an official change to the text of the rules. Instead of relying on the definition of when a penalty is committed as described in 6.1.1.1, the rule regarding the point of no return has been edited to make it clear when during a penalty the PoNR line should be referenced. 6.2.2.1.1 – If, after being sent to the Penalty Box receiving the appropriate hand signal and verbal cue, all parts of a penalized Skater have passed beyond Point of No Return, the Skater must skate all the way around the track in order to enter the box from the appropriate counter-clockwise direction. This makes it clear that the line only matters at the point at which a player realizes they need to go to the penalty box; where a penalty was actually committed is irrelevant to it. Note that this does not change when a skater is considered “off the track” for scoring purposes, which is still at the instant that the penalty is committed. As of this posting, this rule has not been updated on the WFTDA online rules page. Even if it is, it will not be updated in the official rules PDF or hardcopy versions of the rules this year. Adding to this the official-but-not-official changes to WFTDA uniform number rules made a few months ago, there is now an even further deviation of the “true” WFTDA rule book from the one made readily available to the public. If the WFTDA issues any more changes or clarifications to the rules before the important roller derby gets under way at the playoffs starting this August, we’ll let you know about them.